The long awaited Nvidia GeForce GTX 1080 Ti is finally here, and it’s a doozy of a graphics card. Packing 12-billion transistors and 3,584 CUDA (Compute Unified Device Architecture) cores, it’s one of Nvidia’s most impressive graphics cards yet. 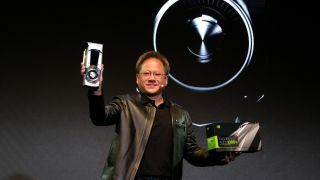 What’s more, Nvidia has engineered the GPU’s 11GB of GDDR5X RAM to operate at an even higher 11Gbps compared to Pascal GPUs – including the Nvidia GTX Titan X – that only went as high as 10Gbps. Nvidia’s highest-end gamer-focused GPU also can overclock to 2GHz and has a boosted frequency of 1.6GHz. That makes it a hair quicker than even the Nvidia Titan X that normally operates at 1.5GHz. All of this amounts to what Nvidia claims is its best Ti card, offering a 35% increase in performance over the original GeForce GTX 1080. The GPU maker isn’t leaving its older models in the dust with this reveal, and has announced it will launch overclocked versions of the Nvidia GTX 1080 packing 11Gbps G5X memory and a GeForce GTX 1060 with 9Gbps G5 VRAM. The GeForce GTX 1080 Ti also features a re-engineered power design with a 7-phase dual field-effect transistor (FET) and 14 dual-FETs architecture. Combined with a vapor chamber and double the amount of cooling area, the graphics card runs 5-degrees Celsius cooler and 2.5 decibels quieter than the original. As with Nvidia’s previous GPUs, the 1080 Ti will be first available in a Founders Edition directly from Nvidia with vendor models from MSI, Asus and others coming later. The Nvidia GTX 1080 Ti will be released on next week for $699 (about £560, AU$910). Stay tuned for our full review of Nvidia's latest titanic graphics card.